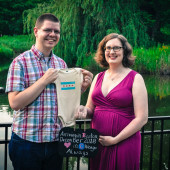 We're overjoyed to welcome Baby Harris-Adam in December! Thanks for sharing in the excitement with us, even from afar. It's amazing how much this little one is already loved!